India’s gross domestic product expanded 7.9% in the January-March quarter, accelerating from a revised 7.2% in the previous three months, as the South Asian nation remained the world’s fastest-growing major economy. Growth for the full financial year 2015-16 came in at 7.6%, a five-year high, compared with 7.2% the year before, the Central Statistics Office said on Tuesday. That matches the advance estimate the office made in February. The quarterly growth number is higher than China’s. The world’s second-largest economy grew 6.7% in the three months through March, its slowest quarterly expansion in seven years. It also shows India remains a bright spot in the world where several other major economies including Russia, Brazil, Japan and those in Europe are either contracting or growing in low single digits. Gross value added—an input of GDP that the central bank monitors—increased 7.2% in 2015-16, a tad slower than the 7.3% estimated earlier. The agriculture sector expanded 1.1% while manufacturing grew 9.3%. 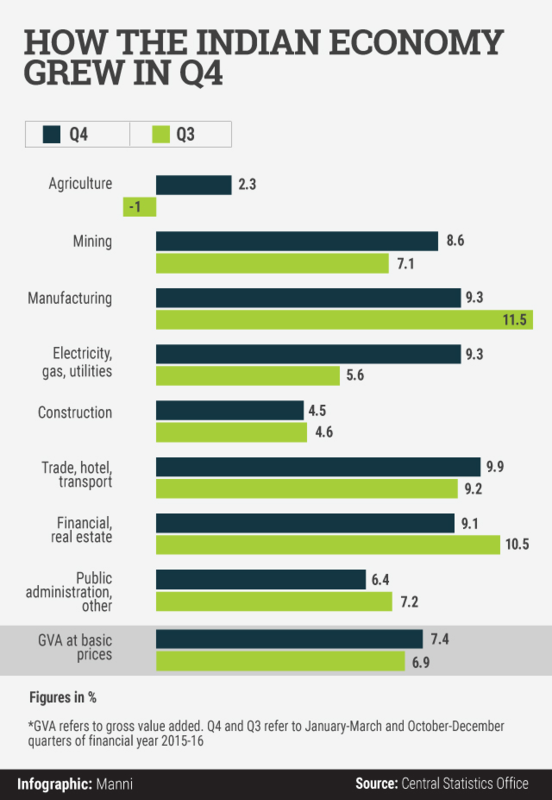 The mining sector grew 7.4% and electricity and gas output rose 6.6% during the year. The data come as a shot in the arm for Prime Minister Narendra Modi’s government, which last week completed two years in office, and has been striving to boost growth, attract foreign investors and make it easier to do business in India. It also bolsters the prospects that the government will meet or exceed its growth estimate for the current financial year. The government said in February it expects growth for 2016-17 to be between 7% and 7.75%. Economists and analysts also expect growth to accelerate this year. Credit Suisse said in a report before Tuesday’s data release that it expects the Indian economy to grow 7.8% in 2016-17 on account of a likely recovery in agriculture and private consumption. Ratings firm Fitch has said that India's GDP growth will likely accelerate to 7.7% this year and to 7.9% in the financial year ending March 2018. Still, there are plenty of hurdles. The government has been constrained by factors including a drought, a banking crisis and its inability to pass key legislation in the upper house of parliament where it doesn’t have a majority. While monsoon rainfall this year is likely to be normal, state-run banks are bleeding due to rising bad loans. And there has been no certainty yet on when a bill to implement the Goods and Services Tax, the most important tax reform in decades, will get parliamentary approval. Another growing worry for the Modi government is inflation. 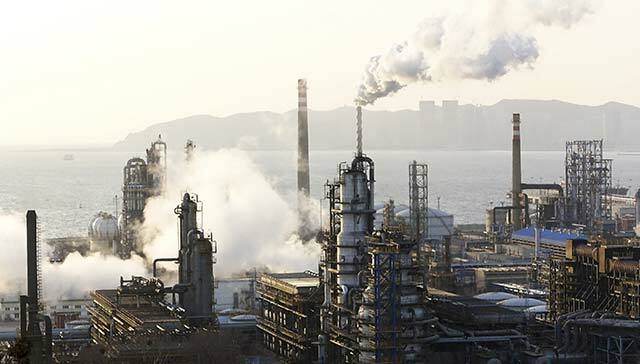 A plunge in crude oil prices below $30 a barrel helped contain India inflation over the past two years but oil prices have jumped above $50 billion in recent weeks. This threatens to accelerate inflation in India, which imports more than three-fourths of its crude oil requirements. Inflation has already been accelerating over the past few weeks. Wholesale prices in India rose in April after falling for 17 months as vegetables and pulses turned costlier. Retail inflation in April accelerated to 5.39% from March’s 4.83% while industrial output growth plunged to 0.1% in March. This points to the difficulties authorities face in accelerating growth while keeping inflation under control. The GDP data also eases pressure on the Reserve Bank of India (RBI) before its next rate-setting meeting on June 7. The RBI last cut interest rates, by 25 basis points, at its April monetary policy review. It has lowered interest rates by 150 basis points overall since January 2015, and RBI governor Raghuram Rajan has been under pressure to cut rates even more to stimulate demand and boost growth.